The perfect blend of wine, food, and cycling. Burgundy: A Wine Lover’s Paradise! Bring up wine and French culinary culture in conversation and it won’t take long for “Burgundy” to be mentioned. Rick Steves described the region as “calm, cultivated, and serene; where nature is as sophisticated as the people.” Join us for a pedal through Burgundy, a land steeped in centuries of incredible wine cultivation! Explore this beautiful land on one of our Burgundy bike tours! Traditions Are Strong in Burgundy. If you’re looking for quintessential French culture, you’ll find it in Burgundy, and you will see why Burgundy bike tours are an important part of Outfitter Bicycle Tours’ offerings. For the perfect balance of culture, adventure, and delicious food and wine, let us show you around Burgundy on a world-class bike tour! Included in your tour are all luggage transfers, jerseys, comprehensive routing instructions, and much more. Browse our most popular itineraries, visiting the most desirable sites in the region. If you prefer to have a special tour a different from our standard itineraries, request a custom tour. Experience the Legendary Côte d’Or Wines. Our Burgundy bike tours start in the beautiful historic village of Beaune, Burgundy’s wine capital. Beaune and its residents are dedicated to the production (and consumption) of the legendary Côte d’Or wines. Côte d’Or means “golden hillsides,” which you will be riding along throughout your bicycle tour. 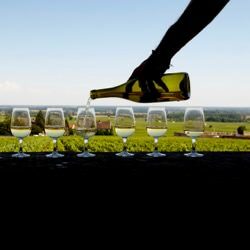 Pedal through Burgundy’s world-renowned vineyards of Nuits-Saint-Georges, Pommard, Volnay, Meursault, Puligny Montrachet, Aloxe Corton and many more. Towards the end of your tour, you will visit the culinary capital of France – Dijon. The city will provide you with an unrivaled gastronomy experience. Once you have had your fill of the best food in France, head south back to Beaune through the Nuits-Saint-Georges vineyard region. Slowing Down is the Best Way to Enjoy Our Burgundy Bike Tours. 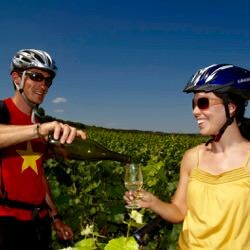 Come join us for one of our custom Burgundy bike tours! We have assembled bike tour itineraries for 4 to 7 nights in this beautiful part of France, but these are simply suggested itineraries. Feel free to reach out to us to customize your dream cycling vacation. Comprehensive routing instructions, including cue sheets with maps. Yes, for most of our destinations and most of our itineraries we can create a fully guided experience. Note that a guided tour requires extra planning lead-time and additional cost. For Burgundy, check out our 5-night GUIDED tour, HERE. 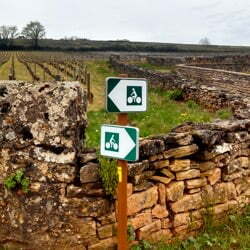 Self-Guided Bike Tours & Guided Bike Tours in Burgundy, France.